From coordinating nursery themes to matching existing home decor, custom quilts can be designed to fit your desired size and style. Consider how your quilt might get the most use in your home. For example, a larger throw size quilt can be quite versatile when used as a throw in the living room or as additional coverage on a bed. A small baby quilt can be a handy item to keep in a diaper bag or in the car, but a larger baby quilt can be a nice play mat and a loved quilt that your child will not quickly outgrow. Custom quilts make beautiful wall hangings, large or small. And they can add a special touch to an engagement photo session, and again as a backdrop to a gift or dessert table at the wedding reception. To request a custom quilt, send an email to sarah@stitchandbundle.com or send me a message through Etsy. A non-refundable design fee and initial deposit is required to begin the design process and construction for all custom quilts. 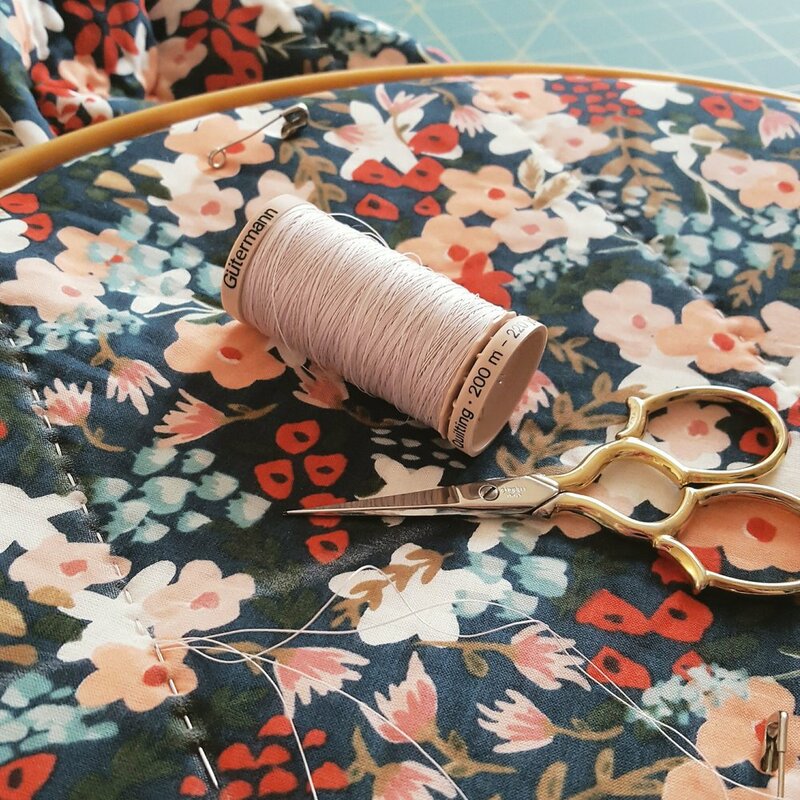 We will discuss quilt size, fabric choices, and pattern designs and I will provide several options from which to pick until we find your perfect combination. The total cost of the quilt is based on size, intricacy of the pattern, and sometimes the type or availability of the fabric. I provide quotes for each different design option, and if you have a budget in mind, we can look at options that stay within that budget. Please contact me directly for further information regarding pricing. Estimated completion times will also vary, but if you have a deadline (i.e. a baby shower or birthday gift), I aim to meet those as best as I can. An additional rush fee may apply. Currently I do not offer king size quilt options. However, larger throw size quilts can still work as great options on queen and king sized beds. I only use the highest quality materials to construct the quilt. This includes high-quality quilting cottons, all-natural 100% cotton batting, and superior quality thread. The individual pieces of the quilt top are stitched together on my domestic sewing maching (I use a Janome 6600), then layered together with the batting and backing fabric. I use a stitching method called "stitch in the ditch" to anchor the quilt layers together and finish the quilting by hand. Because the quilting is hand stitched, the quilt maintains a wonderfully soft drape and is just as durable as a quilt that was quilted on a sewing machine. I attach the binding to the quilt using the sewing machine and sew it down by hand for a seamless, polished finish. Before each quilt is bundled and shipped to its new home, the quilt is prewashed in a gentle wash (I use Soak Wash) to ensure there is no issue with color bleeding. The first wash is the most important, but once the quilt arrives to you, it is ready for love and plenty of future washings. These quilts are meant to be used often for years to come and will only continue to get softer and softer!